Roll Tide Roll! Wrap it up. Call it a night. Sculpt the statue. Nick Saban is the greatest coach to ever walk the earth, and the Alabama Crimson Tide are the dynasty of all dynasties. Sure, the University of Central Florida is the true 2018 college football national champion — just ask the school. But if we’re going by the book and the College Football Playoff system we all demanded half a decade ago, then chalk it up as just another year for Saban and the boys. Somehow, someway, Alabama squeaked into the CFP. Then the Tide smacked reigning champ Clemson to play for their sixth national championship in the last decade. That in and of itself is bonkers. Then, Alabama — which had won four of five of those titles coming in — found itself down 13 points twice in the National Championship against Georgia. The Tide looked all out of whack. But in true Saban fashion, the coach yanked his sophomore starting quarterback — who last year was the first true freshman starting QB ever on a Saban-coached team — and replaced him … at halftime … of the National Championship … with another true freshman … who had only attempted 53 passes in his collegiate career. The result? Tua Tagovailoa, the new QB, chucked some touchdown passes, made some plays with his feet and carried the Crimson Tide back to the top of the college football food chain. Shouts to Bill Belichick and the New England Patriots, but Saban and Alabama have one of the best dynasties of all time. And by the looks of it, the Tide aren’t going anywhere. Saban somehow sends guys to the NFL each year and reloads with guys just as good or better (except kickers, which Saban seems to recruit from backyard football leagues). I say “somehow” but don’t really mean it because at this point it’s probably easy to convince the best high school players to come to Alabama and win all sorts of finger jewelry. But I can’t get over these guys on the Alabama roster. Georgia had plenty of hosses, and you can find NFL-caliber behemoths on gobs of rosters across college football. But my goodness, Saban had true freshmen — 18-year-olds — making major plays in the National Championship. Aside from Tagovailoa, Alabama had freshmen running the ball, catching passes, blocking, tackling. And then, after they did all of those things, the 30 cameras at Mercedes-Benz Stadium zoomed tightly onto the players and blew my mind. How on earth are these cats 18? A year ago they couldn’t buy lottery tickets. I’m a pretty scrawny guy, but back in high school I was even skinnier. I had trouble boxing out our 6-foot-1 running back on the basketball court. 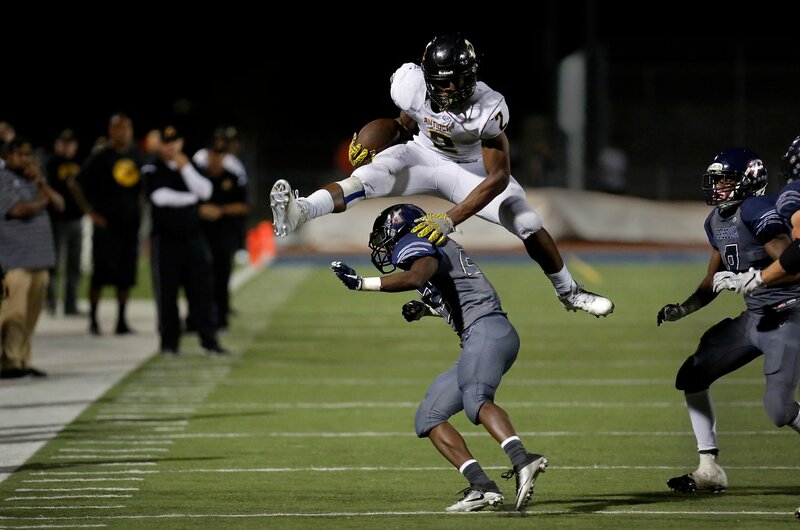 Imagine having to tackle Najee Harris (look him up). What do these kids eat? Who are their weight coaches? I spent my high school career scarfing down chicken patties and fries and standing on the calf-raising machine all gym class. Probably explains a lot. I just looked up Alabama defensive tackle Raekwon Davis. I thought he was a senior or a maybe even a fifth-year guy. He’s not. He’s a sophomore. This might be the largest human being I’ve ever seen. He had a sack in the National Championship in which he blew through the line of scrimmage and came through my television screen and broke my couch. When you watch the best kid on your local field play and get excited, remember there is somebody bigger, faster and stronger out there. That’s no diss on the local boy; that’s just to remind you how good some of these 18-year-olds really are. And they all go to Alabama.